Over the past few weeks I have been contemplating trees. Not only trees for the Afghanistan Build but for my 6mm European projects as well. I played around with making trees from grape branches and toothpicks which worked okay but took a bit of time. I also ordered some cheap trees from 2 suppliers on ebay. These turned out a lot better than expected. When I got them all together they are quite bright and "toyish" in their colouring. A quick dip is some watered down yellow paint (the same one used in the last dry brush for the Afghan terrain boards) and they looked a lot better. 4 types of trees collected. ﻿All the purchased trees, HK and Sydney dipped in diluted paint and drying upright. It feels good to get that all sorted out and I will probably purchase more from the HK supplier soon. Next I wanted to model a vehicle track through the greenzone to add to my collection of built terrain pieces for Afghanistan. This was to be a group of 12" lengths with rises and sections or walls and which enbankments of bushes and trees. Once again 1mm plasticard was used. 4 sections of 12" plasticard was cut with 3 of them being 3" wide and 1 of them being 6" wide. The 6" peice was to allow the track to move from entering on the left of the 3" section to the opposite corner for a bit of variety. 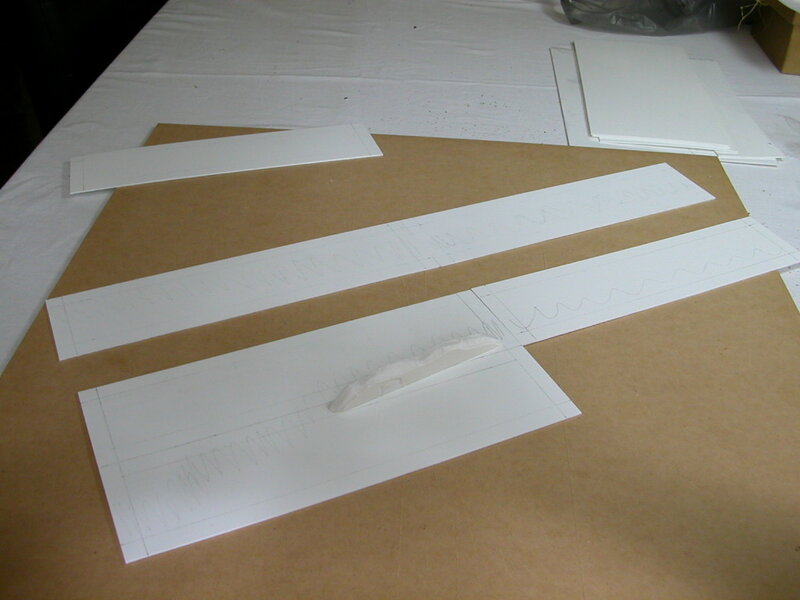 Each piece has the track entering and exiting the same distance from the edge so any piece can be placed next to any piece. As usual, all pieces have a 1/2" buffer around all edges where little or no modelling occurs to allow for neat placement and instant walking tracks for figures. The squiggle is the placement for vehicle marks. 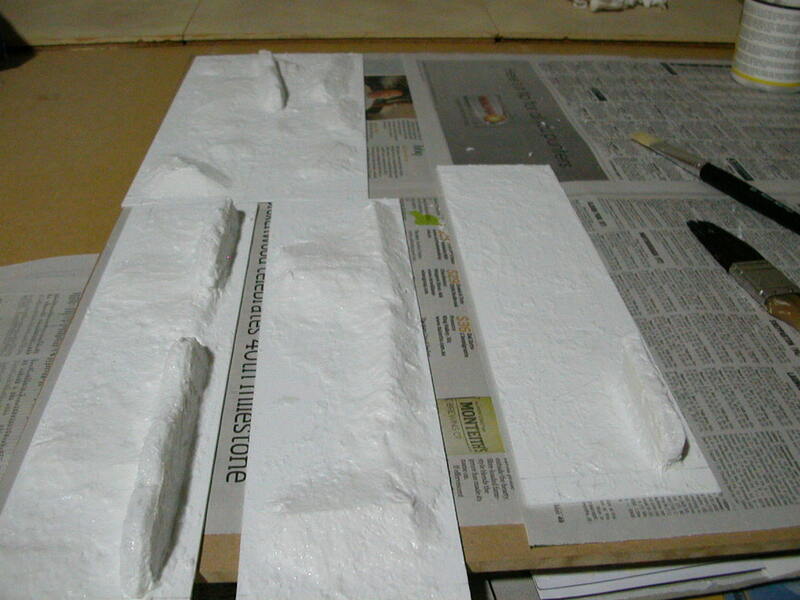 Walls and uneven ground was then modelled onto the plasticard. A trial run of a small US convoy helps confirm sizing and placement. Spakfilla is added to smooth out the features. Medium textured clag is then added to everything in a thick layer. The Caramello undercoat is generously applied. The light beige dry bursh is completed. Grass flock and some bushes are added. A close up of the grass flock and bushes next to the vehicle track. ﻿Next will be added some of the dipped trees but the pieces need a thick matt varnish applied for lockdown. The rest of the week was focussed on how I would model my hills and in particular contours that dominate the Afghan landscape. The usual 1 tile hills would not do in this situation as the ground scale is just too local. 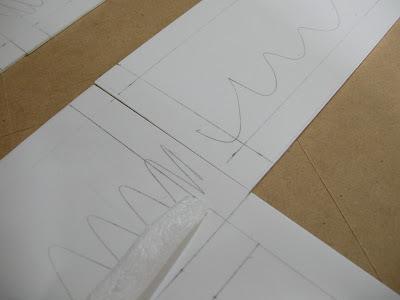 I needed a way to model contours so that some of the 4' x 4' board could be on 1 level while portions of it could be on another or even 2 other levels. These contours then need to be just as flat and just as coloured as the ground level so terrain pieces can be added. I thought of cutting up the cork boards and multiplying them out in stepped increments up to a board that may be 4 or 6 tiles thick. This would work well as the height of the higher board needs to match the build up of the terrain next to it and finish nice and flush and level. The problem is that the cork tiles are more expensive than most other products used in my workshop. There must be a way to use the multiple sheets of 5mm foamcare I have in storage. I decided to use the same system but with 5mm foamcore. Gluing 4 sections of foamcore together creates a block 20mm high. On top of this I place a completed terrain tile. The surrounding terrain tiles are then modelled using the same 5mm foamcore to create a gradient up to that cork tile. This would result in a contour that sits 20mm higher than the ground level. Do this up one more level but adding a gradient tile instead of a flat tile and you now have 40mm contour. I think this would work well and probably is better explained with pics. That is looking spectacular. Can't wait to see it finished. I have to agree, I am all about this project and have started my own in 20mm/1:72. You have inspired me to keep at it. Looks really good! I've enjoyed watching the progress. I already told you in the forums: awesome work. Keep it up, your terrain items are an inspiration for my next games. Had to place Donogh's scenario in Iraq tough, as I lack any Afghan terrain or Talib miniatures. If I am going to build terrain for another conflict, yours will influence a large part of it. Thanks Chris. I appreciate the feedback. While I am not 100% happy with my terrain yet, I have given in to the realisation that this is all an evolutionary process and to get to the terrain I picture in my head, I need to work through the years of crappy results and skills development. I am a results person not a journey person. The trees look good, I like your grape tree, nice one! !